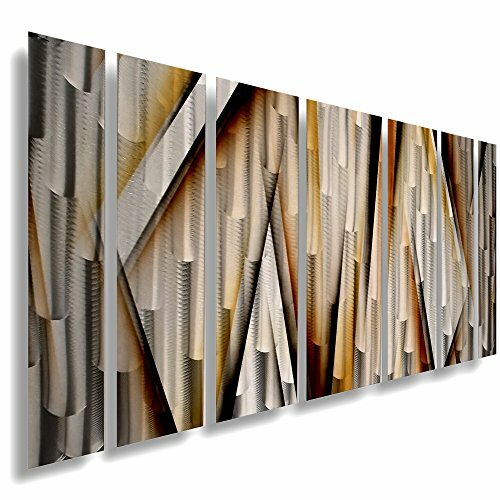 Spectacular metal wall art by artist Brian Jones. Each feature is hand sanded into the metal's surface, creating breath-taking reflections that seem to magically transform as you move around the piece! Serves as beautiful wall art, and a unique conversational centerpiece for your home! Includes full size wall hanging template to make installation to your wall a breeze. Simply wipe down with a soft, damp towel to clean panels. Bright lighting from a track lighting system or window is recommended for maximum viewing effect. Each order is handmade and one of a kind! It will have it's own unique details and nuances, and may differ slightly from the pictured example. If you have any questions about this product by DV8 Studio, contact us by completing and submitting the form below. If you are looking for a specif part number, please include it with your message.